Some schools are struggling to make the transition, threatening the ultimate goal of having a diploma from anywhere in Maine that marks a student's mastery of the same standards. EDITOR’S NOTE: This is the second of three stories about Maine’s move toward proficiency-based education. The series was produced by The Hechinger Report, a nonprofit, independent news organization focused on inequality and innovation in education, in partnership with the Portland Press Herald/Maine Sunday Telegram. Part 1 ran June 11. GRAY — For veteran teacher Michelle Adler, proficiency-based diplomas are just one more foolish idea to come down from a state government that doesn’t understand or respect teachers. Down the hall from Adler, English teacher William Putnam could not feel more differently about the 2012 state law requiring school districts to move to a system focused on skill acquisition rather than course completion. 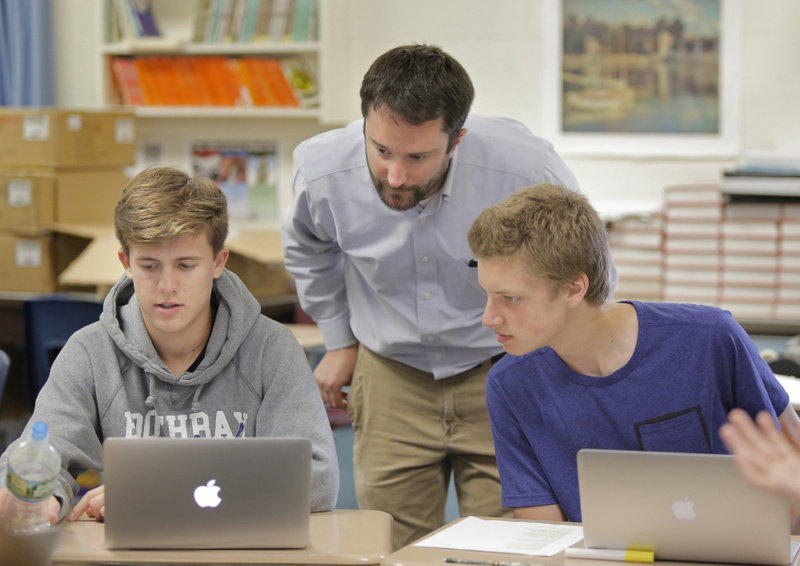 The idea that every student should be given the time and support to learn all the skills associated with a given high school course appeals to Putnam’s sense of what education should be. Veteran social studies teacher Michelle Adler talks to sophomores Maiya Schwartz, left, and Emily Terranova in Honors Human Geography class at Gray-New Gloucester High School. Adler believes proficiency-based learning is another foolish unfunded mandate from the state. The idea that all students can become skilled is the philosophical underpinning for Maine’s grand experiment with proficiency-based education. It is one of just two states – the other is Vermont – to require by law that every school award diplomas based on proof of proficiency instead of completion of course credits. Each of Maine’s 124 high schools is required to offer such diplomas to the Class of 2021, next fall’s ninth-graders. 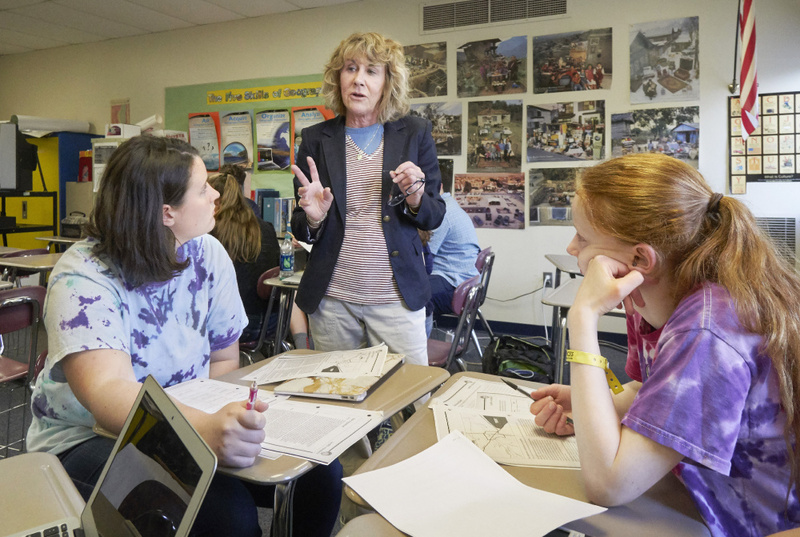 Most teachers would subscribe to the ideal that all students can learn, but translating that noble idea into a system that works for both teachers and students is a giant hurdle. To some educators, offering students all the time they need to learn a subject sounds more like a plunge into chaos than a great new idea. Others worry that struggling students who might have pulled off a passing average will be kept from graduation when they are unable to master certain skills. Still others have focused on details of the proficiency-based model, like dropping letter grades or making homework optional, which aren’t required by the law, but seem like risky notions. Confusion among district leaders about what is required, combined with poor communication to teachers about what must change, have exacerbated the problem in some districts to the point that attempts to make changes have dissolved into distrust and anger. If the problems in such districts are not addressed, it could result in a complete failure of the ultimate goal: having a diploma from anywhere in Maine that marks a student’s mastery of the same standards. 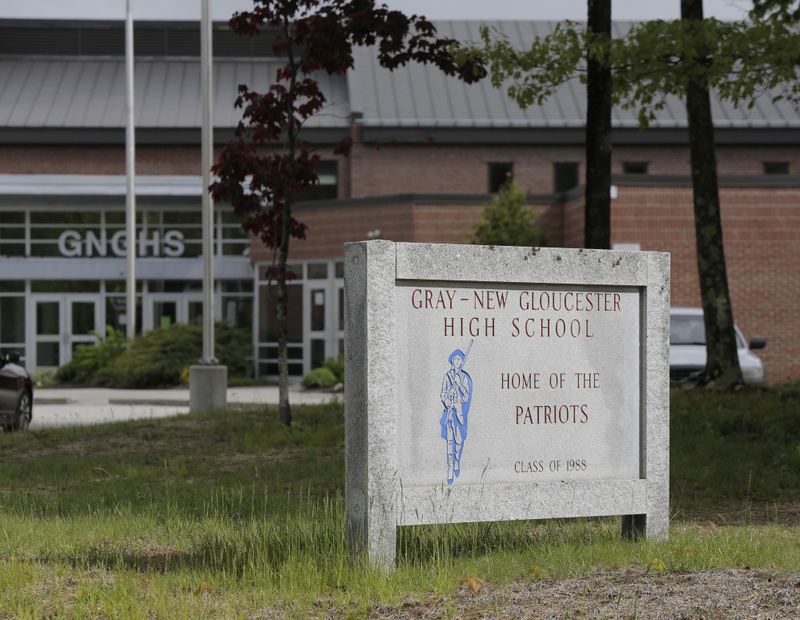 In Gray-New Gloucester, a largely middle-class district, educators have been trying to change since before the law first hit the books. Initially, a group of teachers and an excited administration team jumped in feet first, hoping to overhaul the entire high school experience. The modern high school building, with its wide hallways, sunny classrooms and up-to-date science labs, would seem the perfect setting for the education model of the future. But the school’s efforts have foundered because of changing school and district leadership, varying levels of buy-in from the teachers, and parental concerns about how it will all translate onto college applications. Ted Finn, Gray-New Gloucester’s third principal in five years, acknowledged that the changing leadership has made the transition tricky. He also wants more information from the state, which has not published the rules by which schools will be evaluated. “I’d like the state to say, ‘Here’s the model. This is what you have to use,’ ” Finn said. Moreover, Finn dislikes the 1-to-4 grading system that some schools are using, disagrees with the idea of ditching deadlines for student work and test make-ups, and wants to make sure parents understand how the system will affect their kids. Now, many elements of the proficiency system that the school originally created – guaranteed test make-ups, a requirement that students earn an 80 percent on key assessments and projects, a February vacation catch-up academy – are no longer in place. “Each teacher has their own system,” said senior Ellie Roy, 17. “Sometimes they don’t let us pass the formative work in late, and sometimes they do,” said sophomore Taylor MacLean, 15. Formative work is any assignment meant to allow students to practice the skills for proficiency. Ellie, Taylor and Tyler’s expressions of dissatisfaction are in sharp contrast to the opinions of students at Nokomis Regional High School, 94 miles to the north, where proficiency-based education has been a hit with both kids and teachers. But their concerns highlight potential pitfalls of the new system that are not unique to Gray-New Gloucester. Without clarity on exactly what proficiency-based education means in practical terms, there is little chance of getting support from skeptical teachers like Adler, who is also president of the local teachers union. And since the law offers little guidance and provides minimal funding, districts are largely left to their own devices to determine what a proficiency-based system should look like. “It was pretty much: ‘We’re doing it. Figure it out,’ ” Adler said. Having teachers who feel that way, especially influential veterans, is a poor start to creating a new system, said Erika Stump, a research associate at the Center for Education Policy, Applied Research and Evaluation at the University of Southern Maine. Given the history of education reform in Maine, which has reversed course several times in the past three decades, concerns about the “long arm of the state” are hardly unfounded, Stump said. Some are leery of the new requirements because they have been championed by Maine’s divisive Republican governor, Paul LePage. Those concerns have not gone unnoticed by the governor’s office, said senior policy adviser Aaron Chadbourne. Clear communication from school leadership, along with a clear understanding of what’s required by the law, is the other key to making a useful change, Stump said. “I’ve literally gone to districts as part of our research and had teachers say, ‘I don’t like this law because I have to do this, this and this,’ and I’m like, ‘The law doesn’t say that; that’s your district,’ ” Stump said. Indeed, one of the concerns about the law is its lack of specificity. But Stump said districts can meet the requirements of the law if they simply establish a standard for proficiency and an assessment to determine if that standard has been met. Inflexible rules about what counts as proficient could derail some students, said Lois Kilby-Chesley, president of Maine’s teachers union. These rigid requirements could end up hurting kids who “aren’t great students” but don’t qualify for special education, she said. “What I see happening is they get to be 15 or 16, they look at themselves and say, ‘I can’t do this work,’ ” Kilby-Chesley said. Proponents of proficiency-based education argue that those students are exactly the ones who stand to benefit the most from the new system. Struggling students should be empowered, not hurt, by being provided enough time to practice and clarity on what is expected of them, said David Ruff, executive director of the Great Schools Partnership, a Maine organization that helps schools put proficiency-based systems in place. Overlapping ideas about what constitutes proficiency-based education contributes to the confusion at many schools. The concept is also known as competency-based education or mastery-based education; the different terms can trip people up. On top of that, new jargon like “formative work” and “summative assessments,” which are basically “practice” and “tests,” can contribute to the sense that the proficiency-based idea is entirely foreign. The closely related theories of personalized learning and blended learning are often conflated with proficiency-based education. They are not the same thing. Personalized and blended learning usually make extensive use of technology to allow students to pursue courses in an almost entirely self-paced system. One of the biggest sticking points for many teachers has been the idea of grading on a scale from “not yet there” to “you nailed it,” rather than giving percentage scores. The idea is to use rubrics – grids listing a set of skills down one side and a number of levels, usually four, across the top – to determine what skills a student has mastered and which still need work. A rubric used to evaluate an essay, for example, might list skills such as proper grammar, sentence complexity and use of textual evidence. A teacher would read an essay and score each listed skill on a scale of one to four. A student could get a level four on grammar and a level two on textual evidence, for example. This makes it clear what students are still working on and gives them a goal for improvement, the thinking goes. But the grading process takes longer and can be unduly burdensome, some teachers argue. A system built entirely on rubrics would also eliminate GPAs, that common metric of high school success understood by post-graduate institutions from colleges to the military. Putnam, the English teacher at Gray-New Gloucester, said some parents were especially worried about this. In the end, the school switched back to a more traditional grading system. Two other schools visited for this series also made the decision to use letter grades for report cards and for reporting to colleges. For schools that choose to do numbers-only grading, figuring out how to convey to colleges what those grades mean will be critical. Not every school is set up to make such changes, said Chris Sturgis, co-founder of CompetencyWorks, a national organization working to promote school systems based on student competency, or proficiency. In addition to having a strong leadership system in place, teachers must be offered the chance to work out the practical issues that come with changing direction. “If they’re empowered, then the students are going to be empowered,” Sturgis said.